Lincoln Continental recall ordered to fix door latches that may fail to engage. February 13, 2019 — A Lincoln Continental door latch recall has been ordered for more than 28,000 cars in the U.S. and Canada. The 2017-2019 Continentals may have door latch motors that suffer from contamination from silicon, resulting in latches that don't fully engage. Ford says there haven't been any reports of crashes or injuries, but a door unintentionally opening while driving is a good possibility. 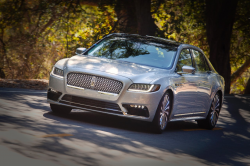 The recalled Lincoln Continental cars were built between November 30, 2015, and November 14, 2018, with the majority (27,000) located in the U.S. and the remaining 1,200 cars recalled in Canada. Lincoln dealers will replace the door latch assemblies on all four doors of the Continentals, but the automaker didn't announce when recall notices will be mailed. Drivers concerned about their doors flying open should call 800-521-4140 and ask about recall number 19S03. The Lincoln recall was announced the same day Ford issued a recall of 1.5 million F-150 trucks at risk of suddenly downshifting into first gear while driving.